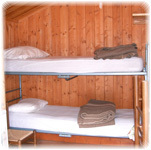 one for sleeping, with a double and a small closet; each bed has two blankets and a pillow. The bathroom with shower with hot water about 10 meters away. It's necessary to bring the dishes, sheets/pillow or sleeping bag (for hygienic reasons are not available). 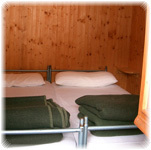 To book your stay in bungalows must pay a deposit (usually 30% of residence within 10 days from the agreements reached) and the balance upon arrival. 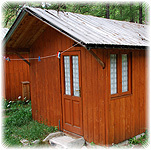 The bungalow on the day of arrival is delivered at 11:00 am and the day of departure must be vacated by 10:00 am for cleaning, unless otherwise agreed with the management. It's not allowed outside the bungalow of the same furnishings, including blankets and pillows. Please be careful not to scratch with sponge stove and sink. 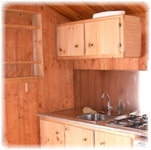 Guests staying in the bungalows are responsible for equipment that is inside of them.